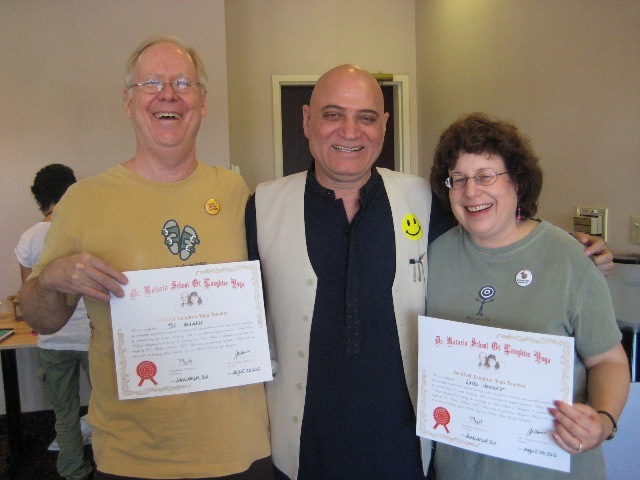 Bill and Linda have now been certified Dr. Kataria as Master Trainers! This means that they can certify new Laughter Yoga teachers. Below is a picture of Bill and LInda holding their new Master Trainer certificate. 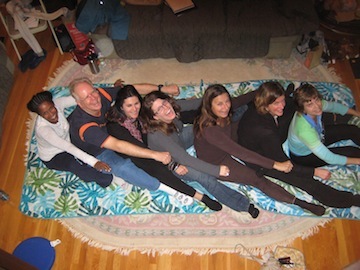 We welcomed 5 new Certified Laughter Yoga Leaders into the world this past weekend! Also 2 Laughter Yoga Leaders retook the training to re-energize their Laughter. 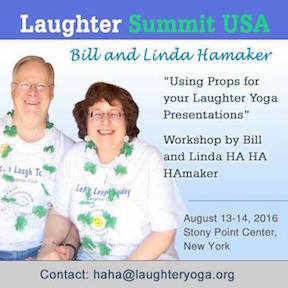 We have just returned from the Second Annual Laughter Yoga USA Conference. It was a lot of fun and also very informative. Here we are with Madhuri Kataria who we spent some time with after the conference. 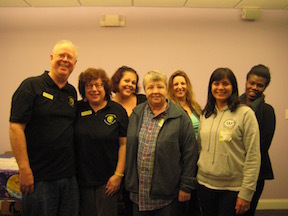 We welcomed 5 new Certified Laughter Yoga Leaders into the world this past weekend! 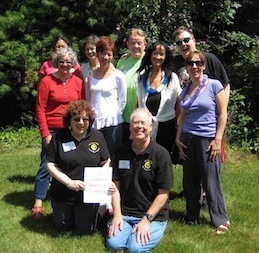 We welcomed 7 new Certified Laughter Yoga Leaders into the world this past weekend! We have just returned from the First Annual Laughter Yoga USA Conference where we gave a presentation titled "Play is the Way". 100 people attended with 3 other countries being represented. 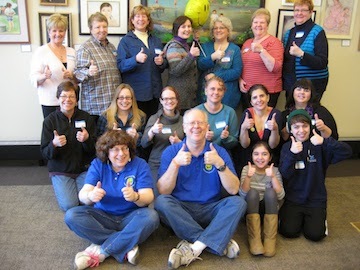 We welcomed 12 new Certified Laughter Yoga Leaders into the world this past weekend! They will be spreading joy & laughter in three different states! 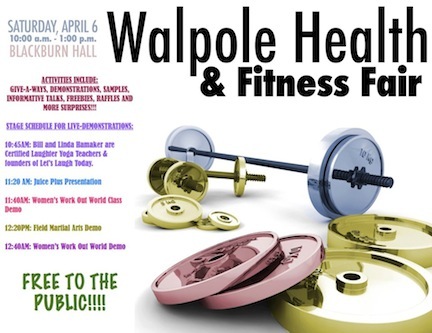 It was a fabulous training here in Walpole, Massachusetts! 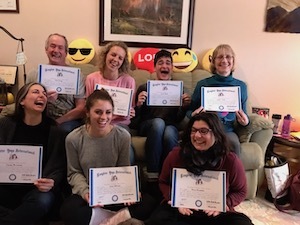 We graduated 10 new Certified Laugher Yoga Leaders at our FUNtastic March 2017 training. Below are the new leaders that will be adding more joy to their personal and professional lives and to the lives of others! We graduated 4 new Certified Laugher Yoga Leaders at our FUNtastic October 2016 training. Below are the new leaders that will be adding more joy to their personal and professional lives and to the lives of others! We had a great time attending the Laughter Summit August 13 - 14. We received many compliments on our presentation on Laughter Yoga with Props. We graduated 5 new Certified Laugher Yoga Leaders at our FUNtastic July 2016 training. Below are the new leaders that will be adding more joy to their personal and professional lives and to the lives of others! We graduated 5 new Certified Laugher Yoga Leaders at our FUNtastic March 2016 training. Below are the new leaders that will be adding more joy to their personal and professional lives and to the lives of others! 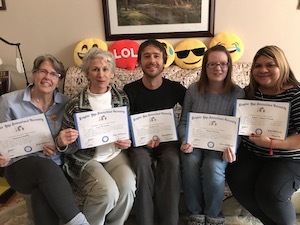 We graduated 5 new Certified Laugher Yoga Leaders at our FUNtastic November 2015 training. Below are the new leaders that will be adding more joy to their personal and professional lives and to the lives of others! 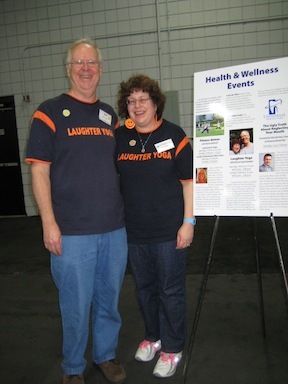 We had a good time leading a laughter yoga workshop at the Live Happy, Live Healthy, Live Green Expo in Woonsocket, RI. A reporter from the Woonsocket Call was there and joined in the laughter. He wrote a nice article about us which was on the front page of the Sunday paper. Click here to see a copy of the article. 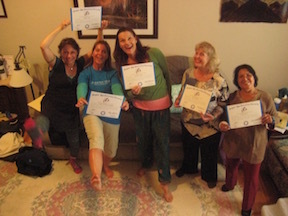 We graduated 5 new Certified Laugher Yoga Leaders at our FUNtastic July 2015 training. Below are the new leaders that will be adding more joy to their personal and professional lives and to the lives of others! 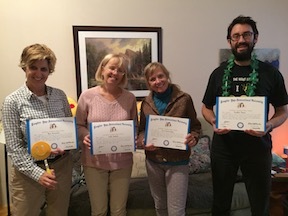 We graduated 5 new Certified Laugher Yoga Leaders at our FUNtastic November 2014 training. Below are the new leaders that will be adding more joy to their personal and professional lives and to the lives of others! 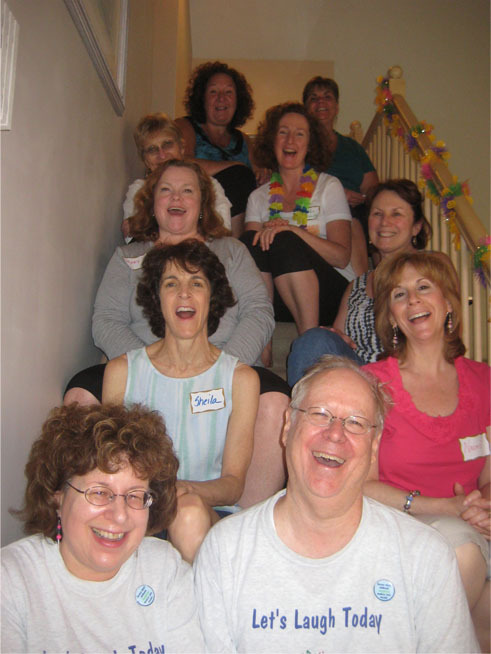 We graduated 15 new Certified Laugher Yoga Leaders at our FUNtastic July 2014 training. Below are the new leaders that will be adding more joy to their personal and professional lives and to the lives of others! Lately Linda has been doing laughter yoga in a lot of different senior centers including Framingham, Brockton, Easton and Marlboro. Click here to see a terrific article about the events in the Brockton Senior Center. She loves working with seniors and will be doing more in the future including a 4 week laughter series at the Acton Senior Center starting Monday, October 27th. The other exciting news is that there was an article about us in the print edition of the Boston Magazine! Click the picture below and then scroll down to the bottom of the page to see the article. In the print edition the article is prominently displayed taking up half a page! On March 7th we were interviewed on Walpole local television show "Artspace". We are doing Part 2 of this show tomorrow. Look for these half-hour shows to appear in their video on demand section soon. 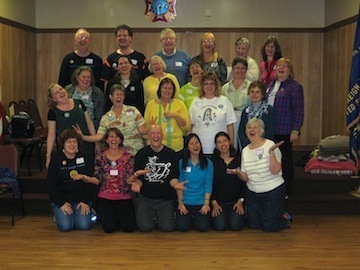 We graduated 15 new Certified Laughter Yoga Leaders at our FUNtastic March 2014 training. Below are the new leaders that will be adding more joy to their personal and professional lives and to the lives of others! We were excited to write an article titled "Spreading Laughter Yoga" for the Innovations Excellence on-line newsletter. The Innovations Excellence web site has visitors from 170+ countries! Click here to see the article. We also had a story about us printed on the front page of both THE WESTWOOD PRESS and THE WALPOLE TIMES this week! Click here to see the WESTWOOD PRESS version of the article and here for the WALPOLE TIMES version. 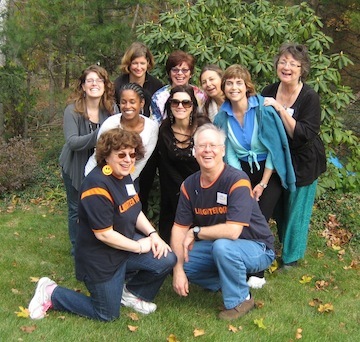 We graduated 13 new Certified Laughter Yoga Leaders at our FUNtastic November 2013 training. Below are the new leaders that will be adding more joy to their personal and professional lives and to the lives of others! 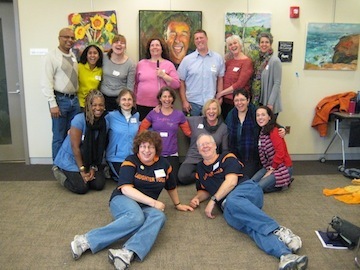 We had a great time at the 2013 New England Laughter Yoga conference in Bellingham, MA. Our workshop on "Improving Your Gibberish" was well received. There is a great article (A Healthy Dose of Laughter) about us in the August Norwood Life magazine. Click here to see the article. 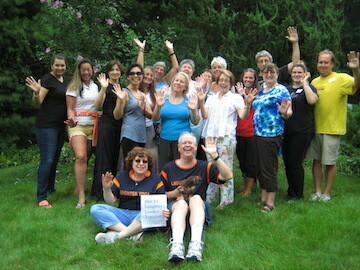 We graduated 7 new Certified Laughter Yoga Leaders at our FUNtastic July 2013 training. Below are the new leaders that will be adding more joy to their personal and professional lives and to the lives of others! 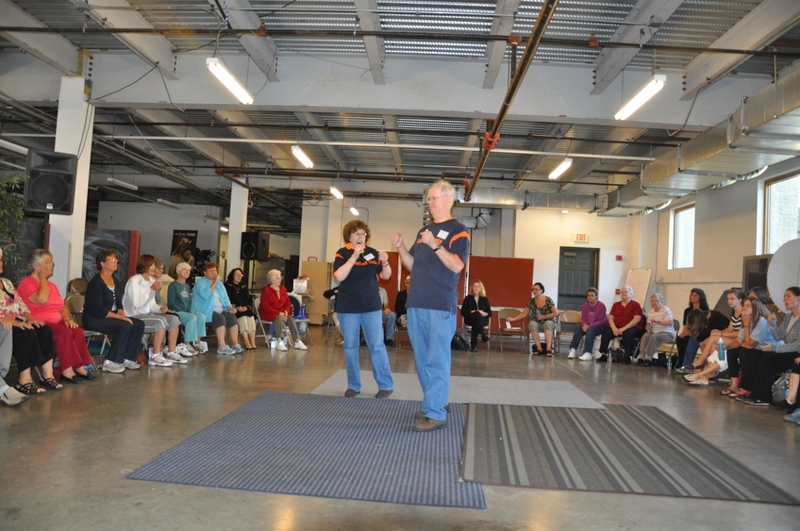 We had a great time demonstrating Laughter Yoga at the Walple Health and Fitness Fair. Below is the poster for the fair. We were the first event in the morning. 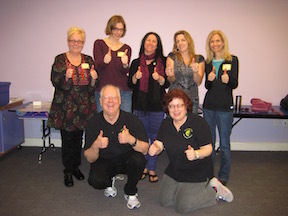 We graduated 9 new Certified Laughter Yoga Leaders at our FUNtastic March 2013 training. Below are the new leaders that will be adding more joy to their personal and professional lives and to the lives of others! Thank you to everyone who allowed the pictures to be taken by the Patch. You all look MAR-VEEEEEL-OUS! HA HA HAppy Holidays to everyone! It's been a busy few weeks. In addition to all our regular laughter sessions we had three special laughter sessions! On Nov. 30th we led 30 students in a laughter session at Brandeis University. On Dec. 6th we led a laughter session as a FUNdraiser for Hurricane Sandy Relief at Get-In-Shape-For-Women in Westwood. And then today, December 13th we led about 70 people in laughter for a Holiday Party at the Milford Senior Center! We graduated 8 new Certified Laughter Yoga Leaders at our Funtastic November 2012 training with students from 4 different states! Below are the new leaders that will be adding more joy to their personal and professional lives and to the lives of others! We were excited to have a front page story about us in the November issue of the Franklin Hometown News. Click here to see the article. Also on November 2 we led a laughter session at The Overlook Life Care Community in a beautiful auditorium there. We enjoyed spreading the word about laughter yoga at The New England 50+ Expo in Marlboro on Saturday Oct, 20th and Sunday Oct. 21st. We did two sessions a day and everyone loved it. 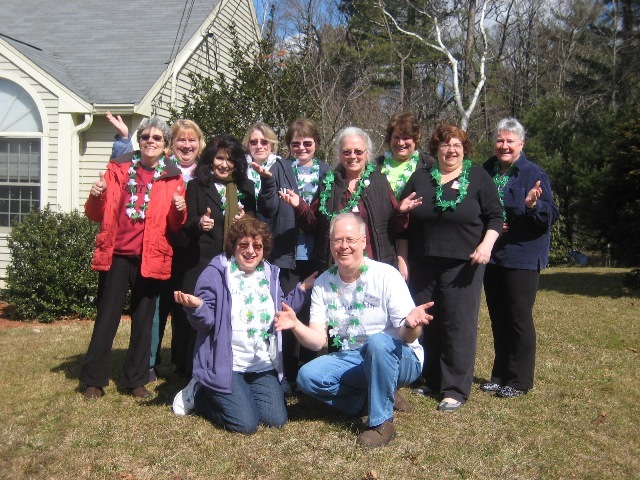 We had a wonderful time leading 55 laughers at St. Joseph Catholic Church in Charlton, MA. Kudos to Father Bob Gratt for doing a fantastic job of publicizing the event in his congregation and the community at large. 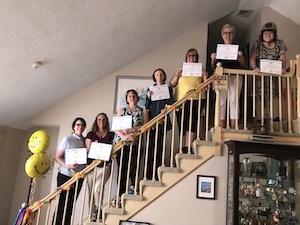 We graduated 7 new Certified Laughter Yoga Leaders at our wonderful July 2012 training plus one of our former graduates attended in order to join in the week-end of learning, laughing, and inspiration! Click the pricture below to see the new leaders that will be adding more joy to their personal and professional lives and to the lives of others! 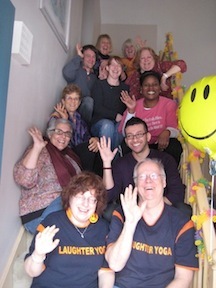 We graduated 9 new Certified Laughter Yoga Leaders at our wonderful March 2012 training. Click the pricture below to see the new leaders that will be sharing laughter with the world! 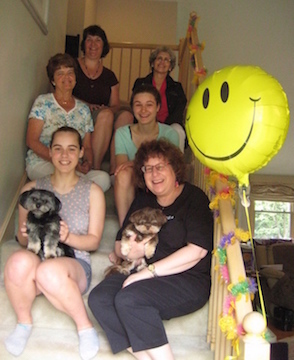 Here is the photo of us in the Milford Daily Times leading the Laughter Bubbles exercise. Our thanks to Dan for stopping by to take pictures of the second anniversary of the Franklin Let's Laugh Today Laughter Club. We had a great time helping out Jeffrey Briar with his Teacher Training in Concord, NH. Three of the students we trained as Laughter Leaders have now graduated to being Certified Laughter Yoga Teachers! Below is a picture of us with Jeffry at the training. 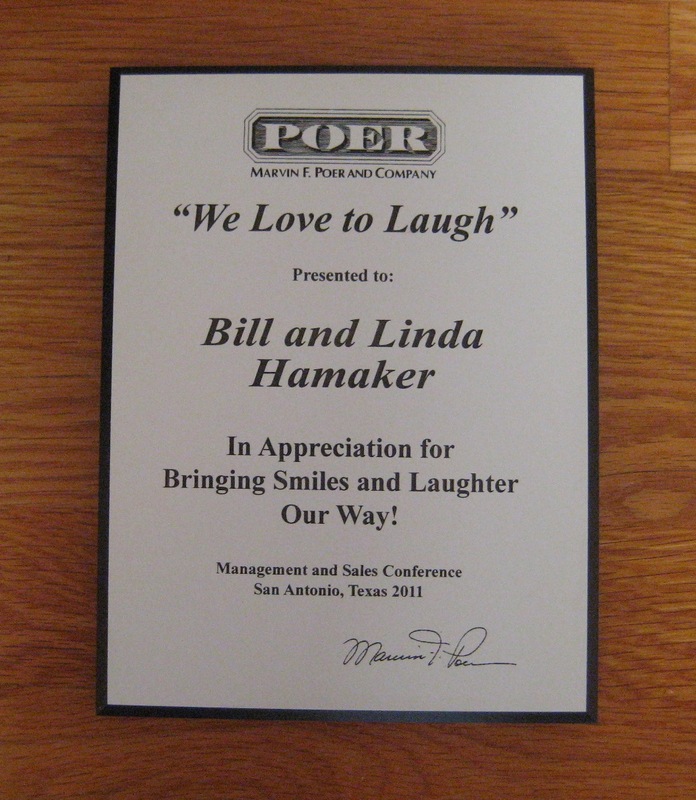 We took a trip to San Antonio, TX and while there we did a laughter yoga session at a business conference. 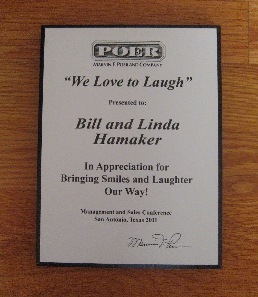 They gave us this nice plaque in appreciation for all the fun the participants had laughing with us. If you are planning a conference and would like to include a fun and healthy break, give us a call at 508-660-2223! 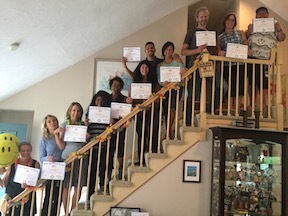 We graduated 9 new Certified Laughter Yoga Leaders at our wonderful September training. Click the pricture below to see the new leaders that will be sharing laughter with the world! 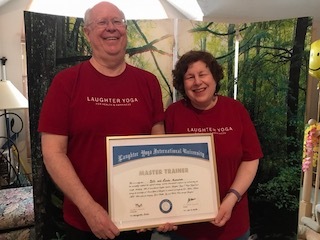 We are excited and honored to have received the Laughter Ambassador Certificate from Dr. Kataria and Laughter Yoga International for our work in helping to spread Laughter Yoga! It rained the day of Our Laughter Under the Stars event in Westwood so we laughed together indoors instead. Vanessa McManus from the Westwood Patch was there to take pictures and a video and wrote about it here: Westwood Patch . 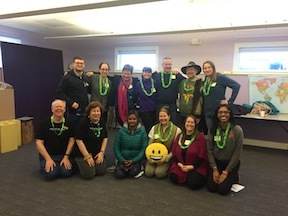 Our April training was a FUNtastic time where we joyfully certified 15 more Laughter Yoga Leaders from 5 different states. We are working on getting a group together now for this lifetime certification on September 24th and 25th. We continue with the successful laughter club in Franklin and the Westwood Laughter Circle and have done laughter sessions for several private events. A highlight last month was creating a whole series of laughter exercises to compose a story about our cruise vacation! We have also added a few new techniques to our sessions to turn "simulated laughter" into "stimulated laughter". There is always something different going on at Let's Laugh Today! On March 7th we presented Laughter Yoga to students at the Westwood High School. Here is a newspaper story about it from the Westwood Patch: Westwood Students Take Time to 'Chill Out' and the associated video. There was also a cover story about it in the Westwood Press. Click here to see it. The new Westwood Laughter Circle is doing very well. Our thanks to Matt Perkins for a nice article about it in the Westwood Patch which includes a video and some pictures. We are looking forward to our second Certified Laughter Yoga Leader Training on April 2nd. There are only a few slots left so if you are interested don't procrastinate! We are pleased that our graduates from our first training have been spreading the laughter. 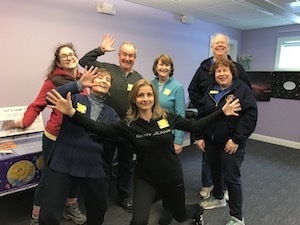 We held a wonderful laughter yoga session sponsored by the Medfield Council on Aging at the Center in Medfield on January 19, 2011 and hope to do more in the future. Of course we still love our club in Franklin on the 4th Monday of each month! The big news is that we held our first Certified Laughter Yoga Leader Training with 11 wonderful students from 4 states. It was a joy-filled weekend and a great success. We feel like proud parents giving birth to our first group of laughter children! They will help spread joy and laughter in their communities. We are already looking forward to having another rewarding training in the spring. Since our last news reports we've had a number of laughter yoga events. 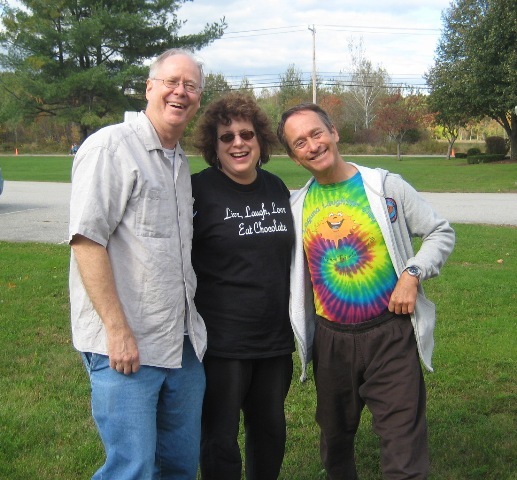 Our October Monthly Laughter Club in Franklin was lots of fun as always and we had events at the Sweet Sue-renity Holistic Center in Rockland, MA and at The Center at Westwoods in Westwood, MA. We also had an uplifting session at the Stoughton Unitarian Church as part of their Free Market of Ideas Program. and Linda brought laughter yoga to the Annual Womans Retreat at the Haven for Healing in Hanson, MA. On October 9th we were interviewed by All The Rage Radio. Our thanks to Dr. Paula Scully for the excellent interview and for creating this valuable website. Click here to hear the interview. The one year Let's Laugh Today Laughter Club anniversary party on September 27th was a great success! Everyone enjoyed the laughter exercises and the delicious anniversary cake. 26 laughers attended! 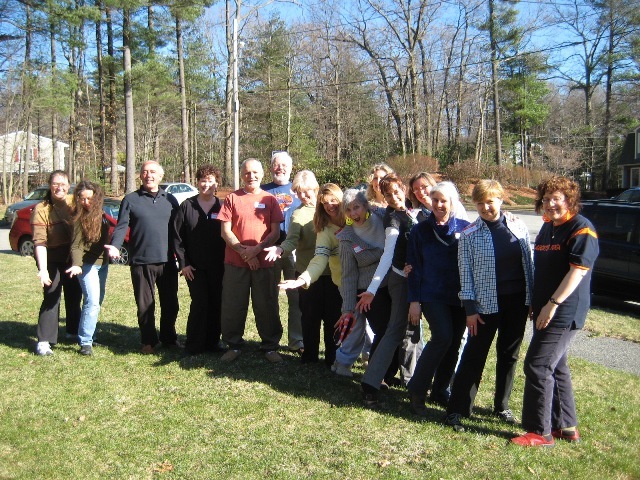 Since our last news update we have started laughter yoga at The Center at Westwoods in Westwood, MA. It is a beautiful spiritual learning center and we hope you will check it out. See our home page for upcoming laughter dates there and in other towns. 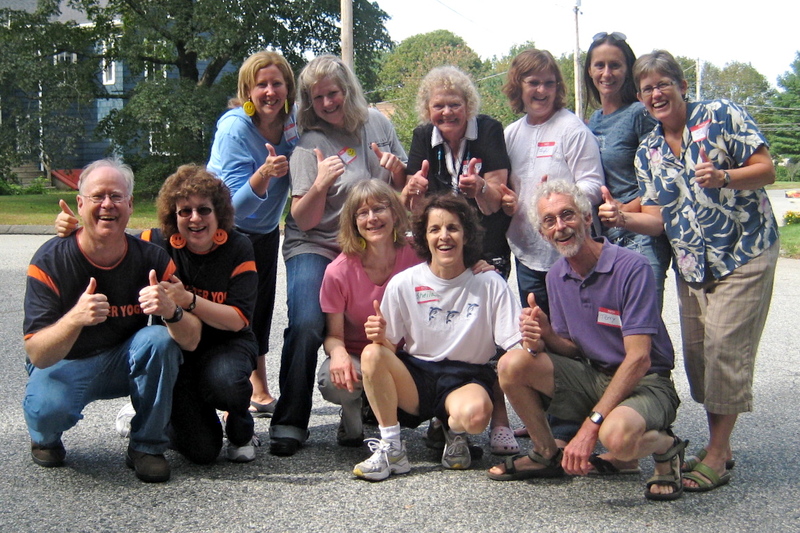 We are excited to be planning our first Certified Laughter Yoga Leader Training class on November 13-14, 2010. Check out our Training page for more details iif you are interesting in learning to bring more laughter into your life. It promises to be a lot of fun! 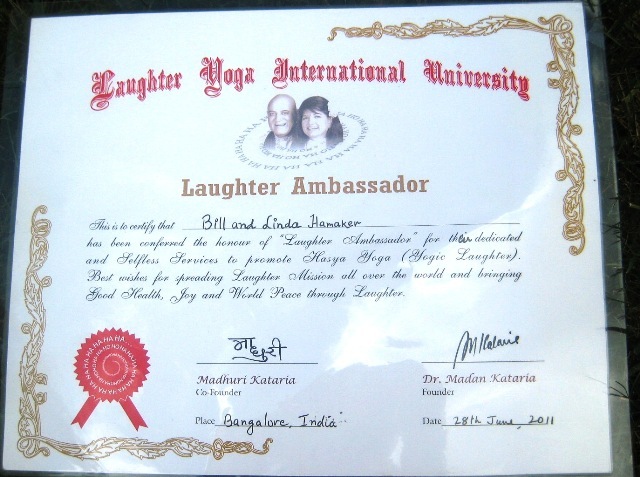 We have now graduated from being Certified Laugher Yoga Leaders to being Certified Laughter Yoga Teachers! 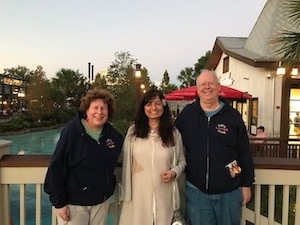 We are just back from spending 10 amazing days in Aubuquerque, New Mexico where we trained with Dr. Kataria himself and also attended the annual American Laughter Yoga Conference. Now we can help spread the joy of laughter by training others to be Certified Laugher Yoga Leaders! We shared ideas with other laughter leaders from 7 countries and 30 states. 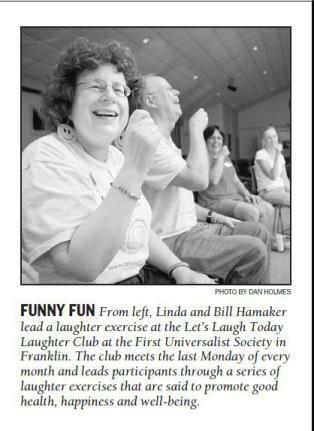 We can't wait to try some of the new exercises at the one year anniversary of the Let's Laugh Today Laughter Club in Franklin, MA on September 27th. Click here to see some pictures from our trip. We have done a lot of laughing since our last news update. The laughter club sessions in May and June were great fun and we are looking forward to our July session on Monday. For the June session we laughed through the story of our recent vacation in Orlando! We are taking a break in August, but will be back in full swing for the one year anniversary of the club in September. The Cumberland Rhode Island Public Library laughter session on June 15th went so well that another one was scheduled on the spot! It will be on September 9th. We have led three laughter workshops at the Sweet Sue-renity Holistic Center in Rockland, MA and will have another on August 12th. A reporter and a photographer came to our June workshop and wrote very nice article which appeared in the Living Well section of the Patriot Ledger and The Enterprise on July 21st. Click here to see the article on line. 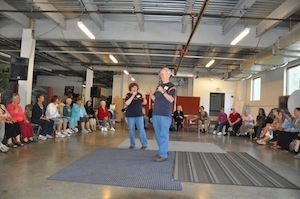 Everyone had a great time at the April 26th laughter club session in Franklin. Since it got warm, we opened all the doors and the peepers outside were laughing with us! 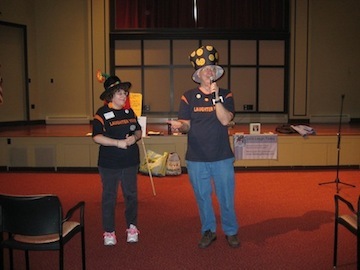 We also led laughter sessions at the Franklin YMCA on April 21st and at the Sharon Community Center on April 12th. There will be another laughter session in Sharon on Monday, May 10th. See our home page for details of this and other laughter opportunities. We were excited to have an great article about laughter yoga and Let's Laugh Today in the May issue of the Fifty Plus Advocate. Look for it in stores or click here to see the article on line. Much has happened since our last news update. Most exciting was our March 22nd monthly laughter club session celebrating Bill's 60th birthday and the club's 6th month anniversary. About 50 people attended and everyone had a great time. The lemon filled cake was delicious! Click here to see all the pictures that Jake Jacobson took of the event. 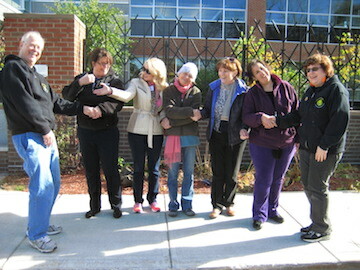 Linda led an amazing private laughter session for 21 men and women from the Son's of Italy in Walpole on March 23rd. Everyone felt very energized afterwards! We also gave a private group session a part of a Live, Love, Laugh women's event on Saturday, March 13th at the United Church of Walpole . We just had our second laughter session at the The Healing Moon on March 29th. It was a small group but everyone enjoyed themselves. We finished up our 5 week "Let's Laugh for the Health of It" adult education class in Franklin. The class learned about the health benefits of laughter and how to bring laughter into our lives on a daily basis. We plan to have another 5 week class in September so mark that on your calendars! Our laughter session on Feb 20th at The Healing Moon in Norwood was nearly full and everyone had a great time. We will be having sessions there approximately once a month with the next session on March 29th. Check out our home page for details on this and other laughter opportunities as well. We can still feel the laughter from the February 22th Laughter Club meeting in Franklin! Next month's meeting will be an extra special one because it is Bill's 60th birthday and also the 6th month anniversery of the club. A local singer/ songwriter, Mike Dakota, will give a short concert of fun songs after the laughter session and there will be cake. We are hoping for the biggest laughter session ever, so invite your friends! We are preparing for the Franklin Adult Education class starting Thursday, February 25th. It should be both fun and educational. So far there are 14 people registered. You can still sign up and get in on the fun! 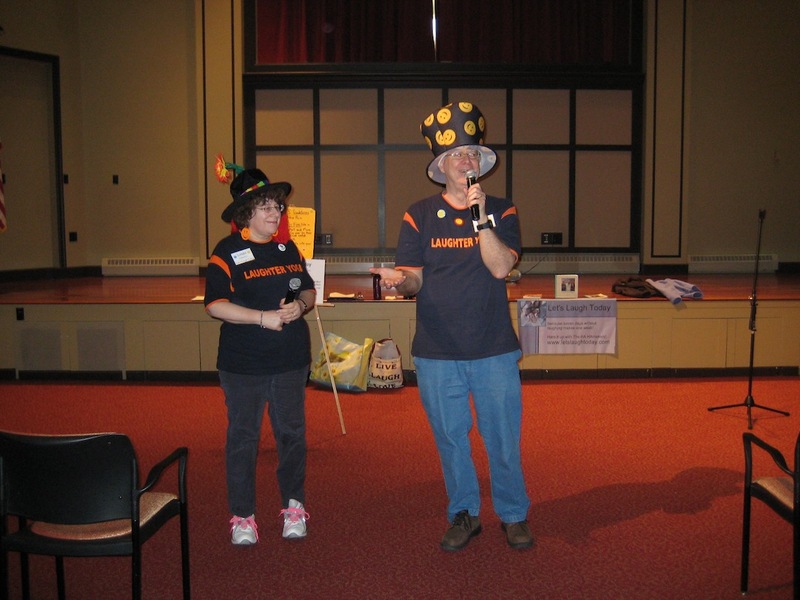 Our laughter session on February 3rd for Working for Work in North Attleboro went very well. We all got to laugh in celebration as we showed our big job offer letters to everyone. Thanks to all the club members who joined us there and helped make it a success! Also thanks to the all those who braved the wet weather for last laughter club meeting on January 25th. We played singing in the rain before the session! There is still plenty space for the laughter session on Saturday February 20th at The Healing Moon in Norwood, Ma. We hope some club members will join us there. And don't forget the Franklin Adult Education class starting Thursday February 25th. Here's you chance to laugh on a weekly basis and learn more about laughter yoga. See our home page for details on all the upcoming laughter opportunities. We had a very busy day on Friday, January 14th. We held a laughter session for the employees of a private company in the morning and then we had a special evening session at Blackburn Hall in Walpole. Both sessions were great fun and we had so much positive feedback! We were so very excited to get an early morning phone call from India on January 3rd. It was from Dr. Madan Kataria, the creator of Laughter Yoga! He congratulated on us our success in bringing Laughter Yoga to the south of Boston. He also told us that he was very busy in India working on creating a weekly Laughter Yoga TV Show and a Laughter Yoga University . Our fourth laughter club session celebrating the New Year was great with over 30 people attending. There's still plenty of room for more! There are some other laughter opportunities coming up including a free laughter session on Thursday, January 14th at Blackburn Hall in Walpole and a laughter yoga class on Saturday, February 20th at The Healing Moon in Norwood. See our Home Page for details. In addition we expect to be teaching adult education classes in Franklin and Walpole. Watch this web site for more details. Happy New Year to everyone. See you on January 25th! Our third laughter club session was a blast with over 30 people attending. There's still plenty of room for more! There was a nice article about us in the Living section of The Valley Breeze on Wednesday November 24, 2009 (click the link below to see it). 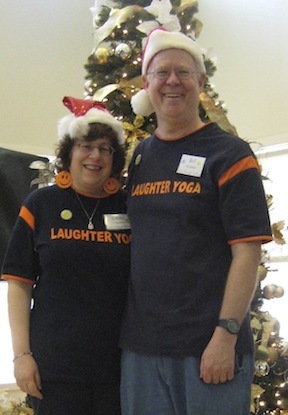 Bill and Linda will be giving a laughter yoga demo class at the Franklin YMCA on Wednesday December 16th. The class is only open to Hockomock Area YMCA members. For more information, the website is: www.hockymca.org. Happy Holidays to everyone. See you on December 28th! Our second laughter club session was another success with 40 people attending! There was also another article on the first session in the Attleboro Sun Chronicle Sunday November 1, 2009 (click the link below to see it). Our first laughter club session was a great success with 40 people attending! There was also a front page article in the Franklin Country Gazette. or try some of the links below. Sebastien Gendry, the head of the American School of Laughter Yoga, lead a laughter session! AARP: Is Laughter Yoga the Best Medicine for Dementia?